Reading a book for me is an emotional journey and not just simply flipping through a set of printed pages. I get deeply influenced and inspired by a book that I read ending up in long winding discussions and debates with my family members, especially, my sister, who is also a voracious reader, even much more than what I am. The exchange of views generally tends to reach such a crescendo that after a while everybody likes to look for a place to hide whenever I embark on my never ending arguments about what I have recently read in a book and what has happened to catch my fancy. Therefore, writing a review seems like a natural corollary to my feisty oration over the negative and positive sides of a book. At least the tired ears of my family members are saved from hearing what I have to say about the book, and mind you, I always have a lot to say! But while writing this particular review, I am in a fix. What do I write about a book whose authoress inspires me more and her persona seems to spill over every write, every blog, each commentary that she pens/types. Readers must be trying to gauge the name of the book that I am talking of. It is a book that has the imperishable insignia of the author herself. Before I quell the curiosity of the readers let me give you a brief introduction of the author and how I came to know her. She is Vimala Ramu, the popular columnist of Deccan Herald, mother of three, married to Wing Commander B.S. Ramu (retd.) for the past fifty years, traveling to and fro USA and India; she is now based in Bangalore. I was first attracted to Vimala’s writings when I happened to read her article in an e-zine called Write Space. The first impression was that of a middle aged lady (she is seventy four) with an impish sense of humour and a hat ke perspective of life. Thereafter I followed her like the Pug of Vodafone ad (I still do). I would read each and every write she uploaded on-line. It was after knowing her through her blogs that I learnt that the phrase “autumn of life” is just a mindset and “winter of life’s journey” a myth and that the art of living lies in living itself and learning from each and every mundane reality of day to day life. When I first addressed her as Vimalaji to show due respect to her age and experience she promptly shot back (on the electronic page) to drop the ‘ji’ from her name and address her by her first name. This exchange succinctly encapsulates her persona. Need I say more? It was when she announced on Face Book that she was ready to give a copy of her books to interested readers I jumped to grab the opportunity to read a book written by my favourite co-blogger. It took ages for the book to reach me courtesy the postal services of Mera Bharat Mahaan. When it at last arrived I was too excited as I always am to receive a book. A thin slice bound in hand made cloth cover jacket, bottle green in colour on which in gold was written Wind Chimes by Vimala Ramu published by Writers Workshop(WW - Green Bird publication, wherein Green Bird stands for fiction), the publishing house (a one man show) which has patronized many an upcoming and promising writer. Interestingly, this book commemorates the publishing house's fiftieth year. The get up of the book, the calligraphy of Prof. Lal (the doyen behind WW) in the beginning, the neat, small prints, reminded me of an ancient manuscript written with feather quill on unprocessed papyrus. 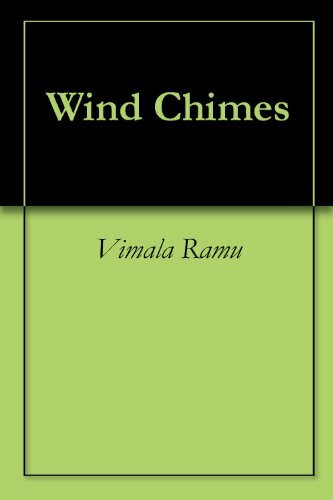 Wind Chimes is divided into two parts – the first part titled “Fiction” contains eight short stories and the second part is called the “Memoirs” containing eight interesting anecdotes from the writer’s early life, school days, career as a teacher and takes on a number of issues. Needless to say the book makes interesting reading though some of the chapters under memoirs have very abrupt end. But what took me by surprise were the short stories. They were just slices of life. (1) End Of The Rainbow –UK returnedBabu spills the beans of one Muthumama and his story of survival in the UK who is otherwise held with awe by his fellow villagers and family members. (2) I Was Jyothi’s Eyes – It’s the autobiography of a pair of eyes – how it is callously handled by Jyothi a drug addict and how later it finds a respectable abode in Mohan’s visage. (3) The Silver Lining – Nandu secures a permanent job after much hardship and a difficult childhood but his first salary gets pick pocketed. How will he tell this truth to his family whose survival depends upon his salary? (4) The Graduation - Lakshmana is gifted with an unquenchable thirst for knowledge. But will he be able to fulfill his dreams behind bars convicted of murdering his own father? (5) The Silent Deepavali – It is the story of how laughter and chattering infest the silent Deepavali of Sharada and her deaf and dumb husband Jayanna. (6) The Wait – The story revolves round Vandana and Suresh who wait a lifetime to be with each other. (7) Statistics Do Not Lie– There is a secret behind the uncanny physical/facial resemblance between Dhriti and Sumana, which only Meena, one of the teachers in their school, knows. (8) The House That Jaya Built– This is the story of Jaya, abandoned by her husband and looked down upon by society, how she rose with grit and determination to make a secured life of her own. Here, I will not talk of the narration, the language, the expression or the writing skill of the authoress because it is here that the character and mind set of the authoress invades each story to make it her own. Reading and interacting with Vimala I have come to the conclusion that age has nothing to do with zest for life. It is our ingrained perceptions, irrespective of the number of years spent on Mother Earth, which colour our thoughts and approach to life. Unflinching optimism, sunny rays of hope, victory over mental and physical handicaps in the midst of despair and doom and an x factor which I have not been able to define as yet infiltrate the stories and the anecdotes comprising Wind Chime. I would go with the word ‘chutzpah’, in absolute admiration of Vimala’s writing skills, sans its negative connotation stressing more on the gutsy undertone. I wish the chimes reverberate forever. I am told that Vimala has stopped writing fiction. I hope she resumes writing the same because these can be the instruments of hope and happiness to perk up the most depressive of readers like it has shown a new way of living and thinking to me. Knowing Vimala will be incomplete if one doesn’t go through her blogs. I also wish and pray that these are compiled into a book soon so that more readers can take the pleasure of her writings which at best can be summarized as munching a handful of crisp cheese-lings with a steaming cuppa tea. Much requires to be said in favour of Writers Workshop about which I shall soon be uploading a separate review to let the readers know more about this unique publishing house.